"It's better to voice your opinion than to stay silent." We're sisters and we moved to Miami from Venezuela to escape overwhelming violence and chaos. We experienced kidnappings and abuse and saw democracy fall apart before we finally left to build a new life in the USA. We love it here and we wish we could vote to make our voices and opinions heard, but we can't because we're not citizens. We hope that you'll click the "Promise" button to show you'll vote on our behalf, with love! 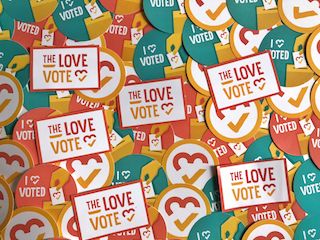 Show Susana & Cristina love + inspire others + get voting info + get event invites + get stickers + create change!